Sorry again about the snafu last week with me forgetting to upload the comic image like a dope! By the time I realized it, I was 1,000 miles away from home, so I was forced to wait. But now, Animazement is over and I’m back in Louisiana, at least until E3 next week. The convention was a ton of fun and it was once again a real treat to meet and talk with fans of the comic! I sketched up a bunch of strange drawings, fulfilled numerous Waluigi requests, posed for pictures, and even met a Shy Guy (well, girl)! All in all, it was quite awesome and really reminded me of the best aspect of drawing a comic. So, today’s comic. 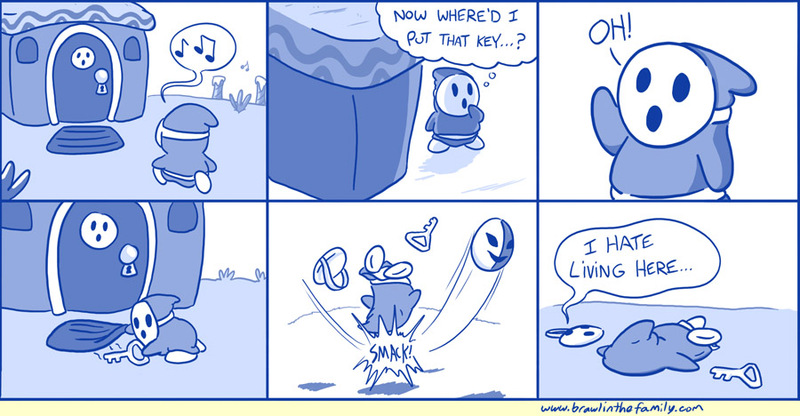 The bottom line is that Phantos are jerks that guard keys unrelated to them, so practice tossing that thing across the yard to keep them out of your hair as you unlock your door.